How to embed the Jail Guide Prison Sentence Good Time Calculator on your legal website to help defendants calculate the amount of prison time they reduce. 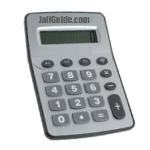 The Jail Guide Federal Prison and State Prison Sentence Calculator, or, Earned Good Time Calculator has been made to easily embed on your site. Simply copy and paste the code listed below into your web page and then point some traffic to it. The Jail Guide Prison Sentence Calculator allows a person to input their prison sentence information to receive an automatic calculation of the "possible" good time credit they could receive while in prison for good time earned. Simply click on the box below and copy. Open your web HTML page or Wordpress page and paste the information. You will need a white background as the calculator is not transparent. To use our calculator on your page you hereby agree and acknowledge not to attempt to crack or disassemble nor otherwise meddle in our code or use or place the Jail Guide Prison Sentence Calculator on any site with malicious or otherwise evil intent.